The global economy is becoming a more integrated and competitive neighborhood. Driven by new investments and the jobs that come with them, the expansion of the global economy into coordinated production and supply chains brings both benefits and opportunities. It also raises questions about the source and location of future jobs and growth. Offshoring, the practice of moving production to foreign locales while continuing to sell goods to the U.S. market, is a pervasive feature of the U.S. economy today. Market pressures drive businesses to seek reduced production costs, often in places where standards of living and protections for workers and the environment are more lax than in the United States. Moreover, an ineffective tax structure further encourages the relocation of assets and production to foreign countries with lower costs. Policies such as a tax credit that reduces the costs a company incurs when it reshores jobs back to the United States would help slow this trend. In addition, the financial incentive to bring production back would help workers here at home, where production loss has led to broad downward pressure on wages across the economy, even in industries relatively insulated from international trade competition. Offshoring is a prevalent feature of the U.S. economy, with much of this trade occurring within multinational companies’ corporate families. 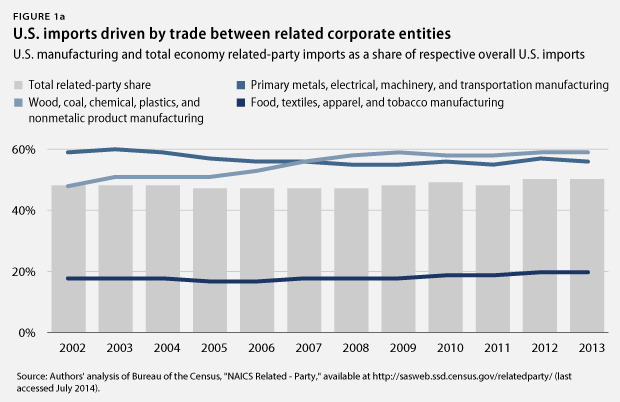 Figures 1A and 1B show U.S. Census data on imports and exports to and from the United States that occurred between related corporate entities as a share of overall U.S. goods trade from 2002 to 2013. 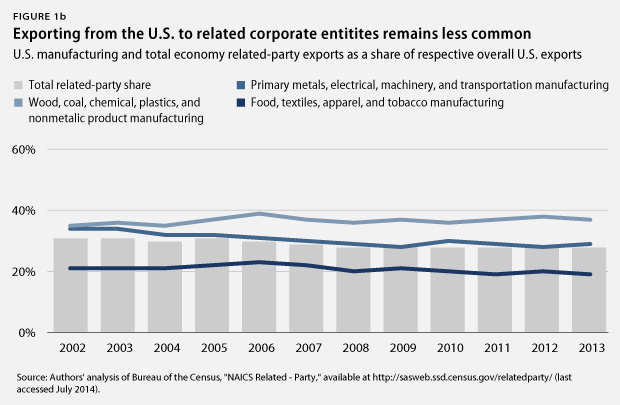 As is clear from Figure 1A, the share of products imported to the United States from related corporate entities constitutes nearly half of all U.S. imports since 2004. As more businesses moved production to lower-cost regions, this share increased to 50 percent in 2013, up from 48 percent in 2004. When looking specifically at the manufacturing sector, imports for capital-intensive industries such as machinery and chemicals—primary drivers of productivity growth and innovation—illustrate the hollowing out of U.S. industry through their disproportionately high share of trade between related corporate entities relative to the overall economy average. 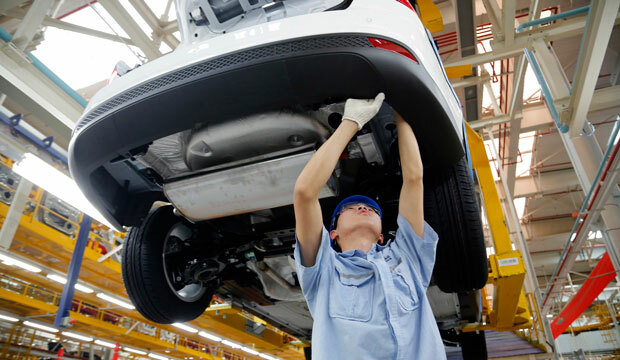 Paradoxically, U.S. companies were much less likely to engage in production relocation in low-capital and low-skill, labor-intensive manufacturing industries over the past decade, indicating that U.S. and global businesses see the U.S. market more as a destination for sales than as place to invest in production. In comparison to Figure 1A, the related-party exports shown as a share of overall U.S. exports in Figure 1B indicate that offshoring is a two-way street. Multinational companies from other countries are locating production in the United States for sale in other countries’ markets but are doing so at a much lower rate than the U.S.-based companies locating production offshore to supply goods to the U.S. market. In reality, offshoring is an even more pervasive phenomenon than is displayed here as these data capture only the related-party aspects of the practice. Outsourcing—offshoring through arms-length contractual relationships between separate entities—is common as well. The recent rising U.S. surplus in services trade—particularly financial and legal services and licensing income from intellectual properties—also reflects the offshoring phenomenon, not merely the competitive strength of U.S. service industries. Data from the Bureau of Economic Analysis show the share of trade in services exports that occurs within related corporate entities. 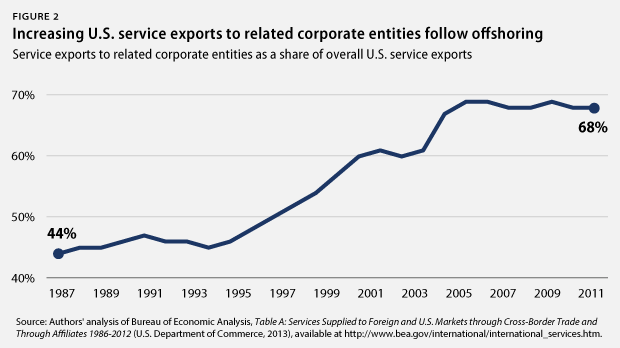 (see Figure 2) Starting around 1993, the share of U.S. service exports to related corporate entities began to grow, reaching nearly 68 percent of overall service exports in 2011. This was up from around 45 percent in 1987. The trend is clear: As offshoring practices increase, companies need to provide more wraparound services—the things needed to run a businesses besides direct production—to their offshore production and research and development activities. Rather than indicating the competitive strength of U.S. services businesses to expand abroad, the growth in services exports follows the pervasive offshoring of manufacturing and commercial research activities. Finally, offshoring and import competition are taking a toll on wages in the United States. Recent research from Michael Elsby of the University of Edinburgh, Bart Hobijn of the Federal Reserve Bank of San Francisco, and Aysegul Sahin of the Federal Reserve Bank of New York shows that the more a U.S. industry is exposed to offshoring pressures, the more downward pressure is put on the wage share within it. 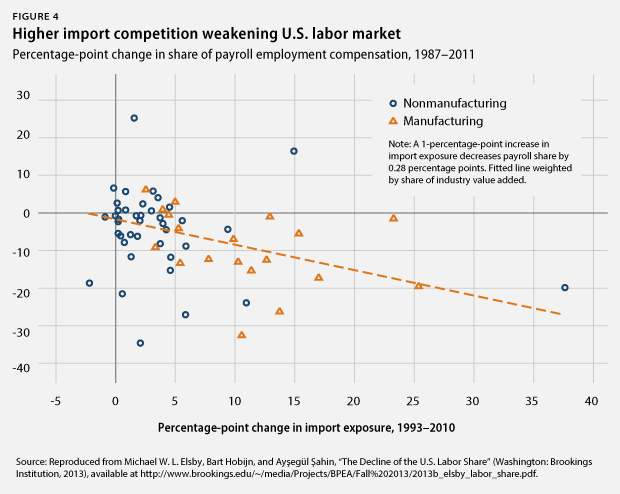 (see Figure 4) The authors show that this wage effect, steadily building over the past 25 years, has been felt broadly across the economy even—though less intensely—in non-import-competing industries. As is evident from the figures above, increased economic competition, market pressures, and an ineffective tax system have resulted in an increase in the practice of moving production to offshore locales and then selling goods back to the U.S. market. Policies such as a tax credit that reduces the costs of reshoring jobs back to the United States would go far to ameliorate this trend. Similarly, a tax credit could help slow the growing negative pressure on wages evident in most import-competing industries. Adam Hersh is a Senior Economist at the Center for American Progress. Ethan Gurwitz is a Research Assistant at the Center.